Each summer many gardeners have the question of mowing grass and weed. Many solve it with the old but reliable old-fashioned tool – hand-scythe. But if the area is large enough or there is not enough time, you can use mechanized help. Today we will focus on how to choose grass motor scythe (trimmer). Motor scythe (grass trimmer, grass cutter machine, grass cutter) is a special garden tool which is designed for cutting grass or small shrubs by using a gasoline engine. For motor scythes as for chainsaws mainly used gasoline A-92, but it is better to watch the best for each individual instrument according to its instruction. Except motor scythes there are also electric scythes which use electrical motor instead of using petrol motor. However, electric scythe requires constant connection to the electrical network and it is not always possible and convenient. Scythes power, as for example, power of chainsaw, is measured in watts or horsepower. Value of watts vs. horsepower is as follows: 1 kW = 1.36 hp. 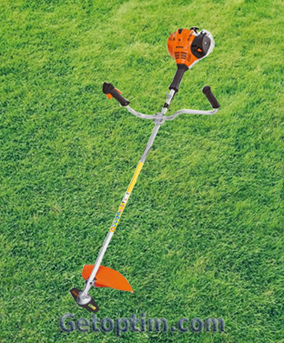 For relatively small lawn grass can be enough 0,8-0,9 kW of power, but in order to mow areas with weeds or long grass you will need motor scythes with minimum 1.2 kW power. Professional Motor scythes have 3 kW power or more. 2. Motor scythes engine type. Most scythes have two-stroke engine. It is the common standard for motor scythes. However, over time more and more begin to appear in the sale motor scythes with a four-stroke motor. A four-stroke motor is less noisy and more reliable, but it weighs more and more expensive. 3. Scythe cutting element type. There are two main types of cutting elements (grass trimmer heads) in motor scythes – knives and cutting wire. A wire for scythes used in grass mowing. It can vary in diameter (mostly 2 to 3 mm). A scythes knife can be metal or plastic and it can have 2, 3 or more cutting surfaces. With such knife you can cut a tougher grass, weeds and even shrubs. When careless handling than can “mow” and the young tree. Most of current grass cutter machine models arranged in such way, which both wires and knifes can be used with them. You must ensure availability of this when you make a scythes choice. Although mowing with motor trimmer is easier than with handle scythe, but it is also required to hold the tool in your arms. So the weight of the tool depends on how long you can work. The average motor scythes weights vary from 4 to 8 kg. Also a motor scythes weight has a direct impact to its power. The more powerful tool is also heavier. We can recommend the weight of 6,5-7 kg for medium power. By the way, you must ensure a special scythe strap presence with motor scythes. Such strap allows you to redistribute scythe weight not only on hands but also on the body, which greatly facilitates the work and reduces fatigue. Let’s say a few words about brands and prices. Motor scythes manufacturers can be divided into three groups: well-known brands, “good China”, “simple China”. Famous brands of trimmer for grass such as Alpina, Stihl, Oleo-MAC, Husqvarna produce high-quality but expensive products. Low-power models from these manufacturers cost $ 250, and model with average $300-350. If you really want to have a reliable machine that will be used often – look to these brands. If you don’t want to overpay for the motor scythes brand – look to “normal China.” They have such names as Tempo, Knight, etc. You need to look at the very quality of materials and assembly of every specific scythe. There are very good scythes models with price of about 140-180 USD. A “simple China” is all that costs about $ 120 or less. There is a real lottery here. Such cheap grass trimmer can work well, but maybe not. These Chinese scythes can be taken only if you need to mow something occasionally. Well, hopefully now you will be aware of how to choose and buy the best scythes for your garden, backyard or cottage.